Works at HS mode(480Mbps) and compatible with USB Audio Class 2.0 Drivers. Break through 24bit/96kHz barrier, ready for 176.4kHz and 192kHz High-Sampling music file. Accepts 16/24 bit resolution, 44.1kHz, 48kHz, 88.2kHz, 96kHz, 176.4kHz, 192kHz sampling rate Linear PCM USB music stream. Two independent X-Tal OSC generate Low-jitter and accurate Audio Master Clock. Includes 24/192kHz enabled DAC and line buffer amp (2Vrms output). Fully isolated S/PDIF coaxial output (75-Ohm load). Includes 300mW powerful Headphone amplifier. 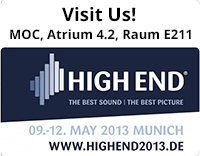 Enjoy High Definition (High-Resolution/High-Sampling rate) music. Rich HD music files and contents are available now. You can download from on-line music store such as www.hdtracks.com.RAL-24192UT1 playbacks HD music stream with original Recording master quality. Fully compatible with USB Audio Class 2.0 Specification. Legacy USB DAC products have a restriction to accept below 24bit/96kHz music files due to use Full-Speed(12Mbps) USB. USB Audio Class 2.0 Device Class Driveruse HS(480Mbps) mode and can treat HD music files sampled by 176.4kHz or 192kHz. RAL-24192UT1 is fully compatible with this new driver and works at HS (480Mbps) mode. Just plug and play with Mac. MacOS X 10.6 or newer already includes USB Audio Class 2.0 Driver. It allows just plug and play service to RAL-24192UT1. You can use it easily under 'iTunes' and 'Audio MIDI setting' . Refer Owner's Guide 'Mac Setup' page. Compatible with famous Music application software and Audio Drivers on Windows PC. Windows does not include USB Audio Class 2.0 Driver yet, the driver must be installed at first time. After installation, you can download and install famous Music software, drivers and plug-in such as foobar2000, ASIO4ALL. Refer Owner's Guide ' Windows Setup' page. Equipped with Digital Audio S/PDIF output and Analog Stereo Line Output. RAL-24192UT1 has two different output. 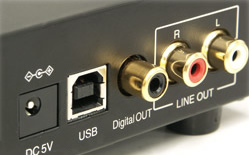 One is Digital Audio Stream (S/PDIF) output for 75-Ohm Coaxial cable. It's completely isolated from PC's digital GND by transformer and fully compatible with IEC-60958 Consumer Specs. Another one is Analog Stereo Line output converted with 24/192kHz high performance DAC. Powerful and Wide-range Headphone amp. 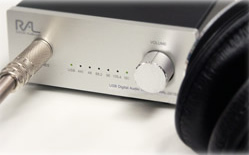 RAL-24192UT1 has a powerful, wide-range Headphone amp and dedicated Volume control for Headphone. You can enjoy HD music with minimum system such as PC/Mac and RAL-24192UT1 with high class Headphones. The volume control does not affect both Digital and Analog audio outputs. Powerful Processor and excellent firmware. RAL-24192UT1 includes 32bit Parallel processing processor and well tuned up Multi-thread firmware. And they provide flawless Digital Audio Stream and high fidelity sound to us. IRAL-24192UT1 has two independent X-tal OSC to generate 44.1kHz based Audio Master Clock and 48kHz based Audio Master Clock. These OSC and circuit provide Low-jitter solution to convert accurate Digital Audio Stream from USB Isochronous data stream. RAL-24192UT1 is designed based on noise reduction technologies with RATOC's long experience to design high-speed digital equipments. This provides clear sound, fidelity and realism to listener. RAL-24192UT1 works with USB_BUS_Power in default mode. If you would like to use external Power Adapter, you must use DC+5V(Regulated)/0.5A or over AC adapter. In external power adapter mode, you have to connect USB cable between PC/Mac USB host port and RAL-24192UT1. RAL-24192UT1 detects USB_Bus Power and turn on internal power switch.